The futuristic look of Trade Show Hologram’s newly designed Hologram projector has proven a success in merging the 3D hologram technology with todays standard media forms. The holographic exhibit seen here at a Chicago Trade Show features standard video monitors in addition to the Holographic projection floating in air inside the display. From that point the team at Trade Show Holograms create 3d renderings of a working prototype of the design to be approved by the client. From that point it goes to the construction phase. Below is a photo of both the concept design drawing and the finished product in use on the trade show floor. Drake has designed hologram projectors in all shapes and sizes. One client required a hologram 20 ft wide which proved a challenge. ” It worked fabulously ” says Drake. 3D hologram projector from concept design to working reality. ” The HIT of the show” is how SEW Canada described the reaction to Trade Show Holograms newest hologram projector design. The new curved holographic projection system offers a futuristic look before the hologram effect is even viewed. 3 video monitors are included to offer clients the opportunity to exhibit existing video in a 2D format while the impressive 3D hologram floats in the air below it. The CIM 2015 show took place in Montreal, Canada and featured this new display which boasts holographic images 3 ft high and 5 ft wide which appear to float in mid air. The display offers full color projection as well as audio to help present a clients sales message. The display is the latest in a series of holo designs offered by Trade Show Holograms for sale and rental to trade show exhibitors across the USA and Canada. The company has proven the industry leader in holographic display technology since its founding in 2006. 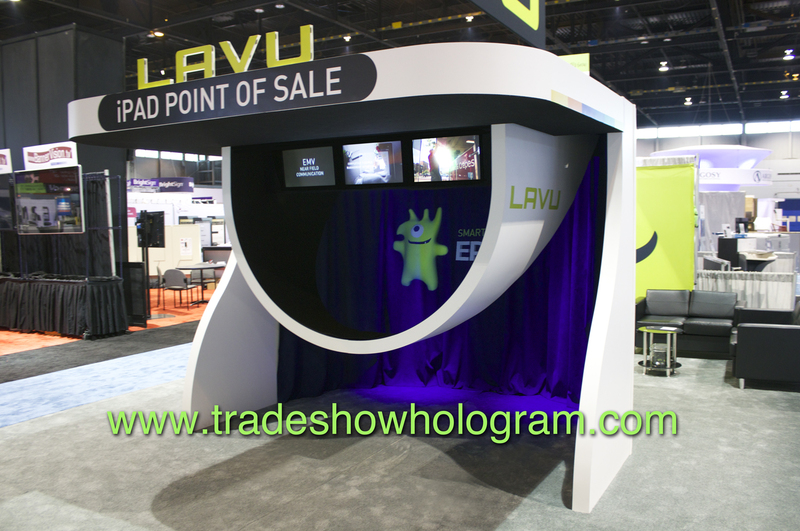 When LAVU Inc wanted to find a way to both draw attention to their booth at the NRA 2015 show and get the message across to show attendees in a fun way they called on Trade Show Holograms for a unique design in state of the art 3D hologram projectors. This amazing display that was featured at a show in Montreal Canada the week before proved as popular in Chicago as it did at the Montreal Mining Show. This special effects display causes a holographic projection up to 3 ft high and 5 ft wide to appear to float in mid air in 3D. There is no need for special 3D glasses for viewers to see the amazing 3D effect. The projections are like something out of Star Wars says creator and owner of Trade Show Holograms, Timothy Drake. ” Its proven quite popular at trade shows over the past several years.” Clients are always looking for ways to stand out from the competition and offer a reason for trade show attendees to be attracted to their booth and their sales message. This special design looks futuristic and also acts as a media hub with its 3 additional video monitors for more detailed video content concerning the clients product and sales points. 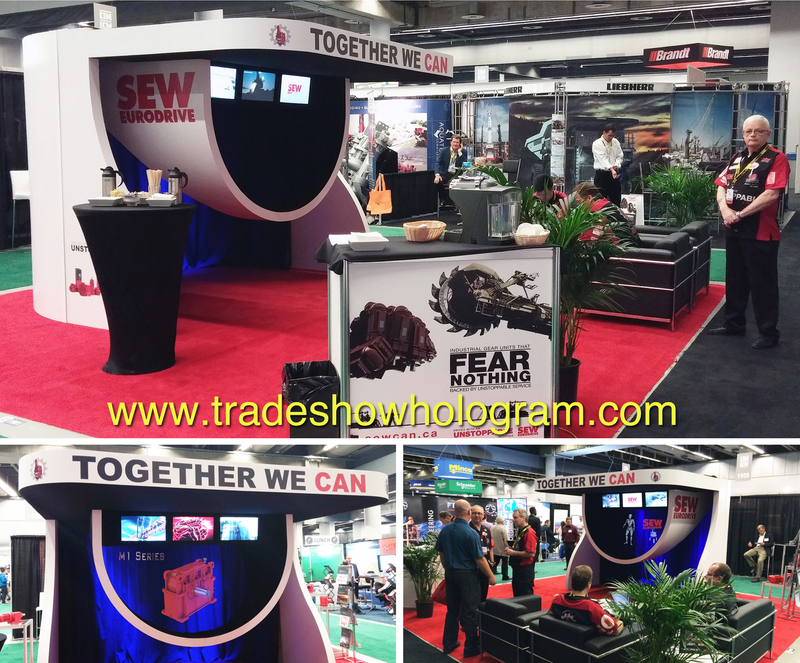 Trade Show Holograms has been the industry leader in holographic special effects for trade shows across North America for the past 9 years but has recently branched into some markets in South America as well. The USA and Canada remain their primary markets however.